Most online poker sites have a feature allowing you to play for free using play money. In the United States, because of the misplaced morality of the religious right and their lackeys in Congress, poker sites advertise that you can play for free and learn the game and have fun in the process. Well, sorry to disappoint you but you can’t play free poker and have fun at the same time. It doesn’t make a bit of difference how many toothpicks, matchsticks, paper-clips or play dollars you win, in the end you have nothing to show for your efforts. Accumulating a bankroll of fake cash leaves you no richer or poorer than you were prior to playing. This simple truth changes the game so much that you cannot hone your skills playing for free. You cannot bluff because there is absolutely no risk. Raises mean nothing because there is no risk. Everyone can be a maniac and when you go broke all you have to do is reload and keep playing. Your unlimited access to play dollars removes rationality from the game, thereby draining all the fun from participation in the masquerade. The essence of poker is money pitted against skill and a bit of luck. Without money skill simply doesn’t matter. So don’t play for free. Learn to be comfortable playing for real cash. At the same time don’t play in games in which your unable to sustain a loss. Choose blind limits within the range that your bankroll can sustain. 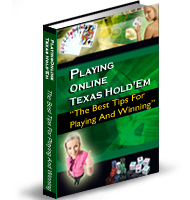 If you want to play Texas Hold’em you must first determine whether you will play in fixed-limit or no-limit games. Fixed-limit games are less volatile than no-limit but they require entirely different skills to play effectively. No-limit is far and away more popular but it carries greater risk in any given session. I play in both limit and no-limit games depending on my mood and desire for taking larger or smaller risks with my money on any given day. I follow a simple guideline for determining the blind limits I will play in cash games. I buy-in for an amount equal to 5% of my entire bankroll or less. For tournament play I pay tournament fees no larger than 2% of my entire bankroll or less. I am generally comfortable buying-in to a limit game for 40 to 50 times the big blind and in no-limit games for 100 to 200 times the big blind. Let’s say, for example that I have a bankroll of $1000. Five percent of that bankroll is $50. That is my maximum buy-in for a cash game. This means that playing online in a no-limit game I can comfortably buy-in to a .25/.50 game. For a limit game my bankroll allows me to buy-in to a .50/1.00 game. As my bankroll grows my limits can increase and as my bankroll shrinks my limits decrease. Disciplined bankroll management is critical to playing winning poker. Often, playing in smaller stakes games is much like playing for free. Because not much is at risk, players are often far less rational than when their risk is greater. Many opponents you meet in small stakes games, anything under a big blind of $5, are less skilled and far less averse to taking risks than players at higher stakes levels. In some micro-stakes games you are playing against opponents who play much like they would if they were playing for play money. It is less likely that your skills will make much of a difference. Playing in small stakes games also provides less earnings per hour than do higher stakes games. If you are a solid player winning 2 big blinds per hour in a micro-stakes game where the big blind is, say, ten cents, you can earn no more than twenty cents per hour. In a one dollar game you would, assuming the same winning rate, earn a mere two dollars per hour. Building a bankroll which allows you to play in more expensive games must be a priority for you when you are starting out. In order to effectively build your bankroll it is important that you play at stakes that motivate you to play your best poker. You should do this at any level but when there is little pain involved in losing it is difficult to stay focused and motivated. If you play at games in which you never feel a risk then you are apt to do crazy things and lose money. When you play where the stakes are to high for your comfort level you are apt to play far too conservatively and give up profits you might otherwise earn. Playing at a level in which the pain of losing is enough to make you uncomfortable but not so much that it will keep you from taking calculated risks and playing with aggression is the right level for you. When coupled with solid bankroll management and stop-loss game plans you will be able to play your best rational game.